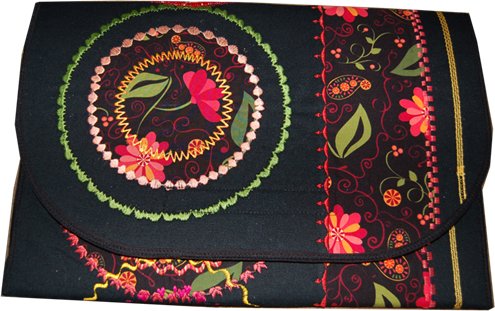 Here’s Pam Craig’s version of a folio project from a class Amanda Whitlatch taught at Southern Sewing School. 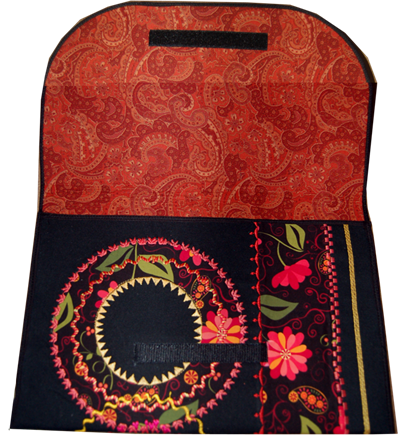 This is a quick and easy project using Bulky Overlock Foot #12/12C for couching thick cord, Cording Foot #22 for couching a group of parallel smaller cords, Circular Embroidery Attachment #83 for the decorative circles, and new Bias Binder #88 to finish the edges. Want to make one of your own? Download The Folio Project instructions from the project page of Amanda’s website – and send us photos of your creations!